I still like your idea of the guide rails. When I get home I will measure the 59'. I think it or my Mustang would be the most challenging. Everything else I envision should be easier. I have pinned my arched car ramps on my small tandem equipment trailer to get he car on as the built in ramps miss by about 3". The following may help determine the angle and length you may want. Lets say you wanted to load a truck with 220" wheel base with the lowest point from the center line being the back corner of the fuel tank 14" above the ground and you have a deck height of 44". With any ramp angle of more than 15° you arn't going to load that truck. Go measure some of the stuff you may load to give you an idea of a angle you want. I do like the idea of guides on the side rails. 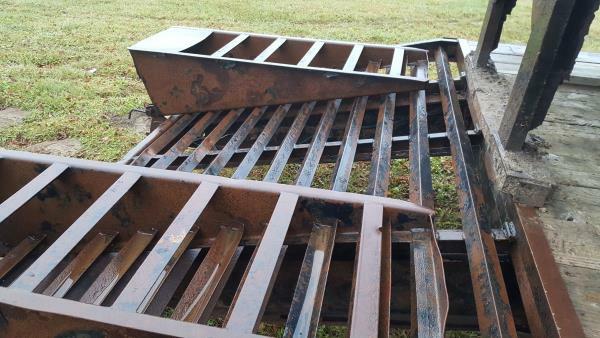 They could be flat stock welded on the sides instead of angle iron. So why not just cut this assembly off and adjust the angle as you weld it to your trailer. You may have to lengthen both the fixed and folding section to the angle and length you want. Maybe only the fixed section could have the guide rails. Putting rails on the folding section will interfere with the fold. Maybe get ScottM or Frank to draw you up some concept plans in SolidWorks to get an idea of who it work. I might be money and simplicity ahead to just put the beavertail on it and then get some heavy heavy duty aluminum ramps and supports to adjust for the hump issue when nescessary. Strongly looking at what I can do to it to make loading my dozer safe in terms of slippage issues. Thinking hard about putting some tall heavy angle on the sides as a safety rail from the axles back and on the ramp system. And also putting strategically placed wood or cleats/metal to insure traction. As previously mentioned this will be waiting in ID for me next spring. Between what I cut off and this, I should have most of what would be needed for plenty sturdy beaver system. Thinking one piece then carry additional gear to get the angle low enough. I still have the beaver/ramp option on the table as well. Simple, sturdy and functional. I am sure the more complicated you make them the more versatile they can be. When we cut off the trailer we will probably have much of the steel needed for whatever we go with plus I am getting that beavertail. After it is cut me may fab up all the hinge assembly setup even if we just pin the Beaver on there and have it fixed at the bottom. Basically set it up so a moving tail is an option later. First thing will have to be moving the axles forward and getting the height where it needs to be. Were you thinking a two stage ramp something like this or one long flip tail? 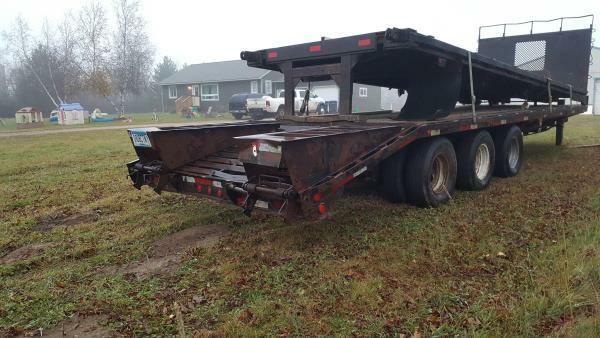 Looking for pictures / drawings of the mechanicals of a flip tail trailer. Leaning strongly that direction for mine. Simple and strong. Willing to also carry ramps and tail support to get the angles down if need be to get over the hump. Looking to build something versatile but not expensive and not complicated.